I did it again. I smocked. This week for Project Run and Play we were to take a plain white sheet and make anything we wanted. I bought (gasp!) a sheet really cheap since I don’t have any plain white ones I’d be willing to part with here. 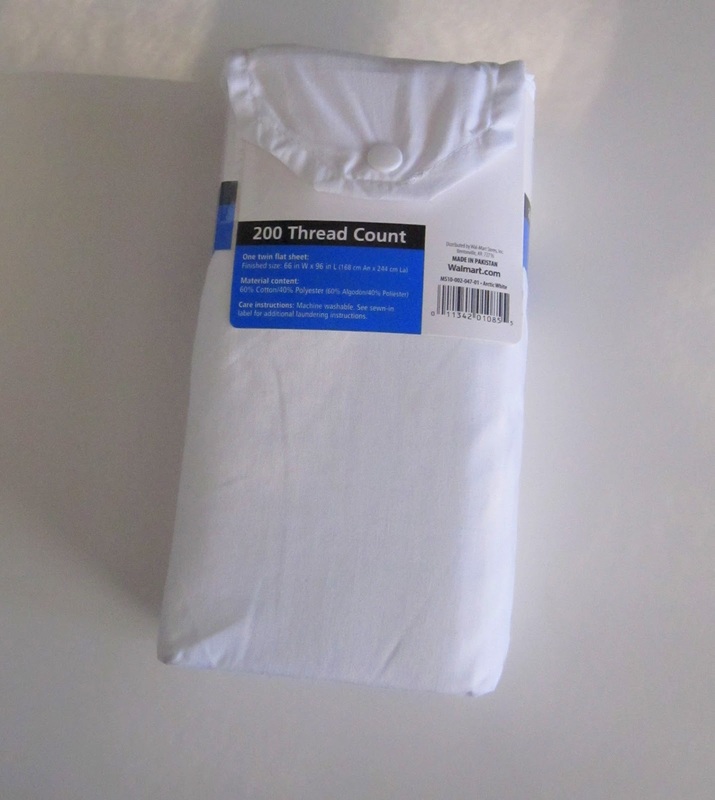 I just bought the twin size and even with that size there was a ton of fabric to play with! 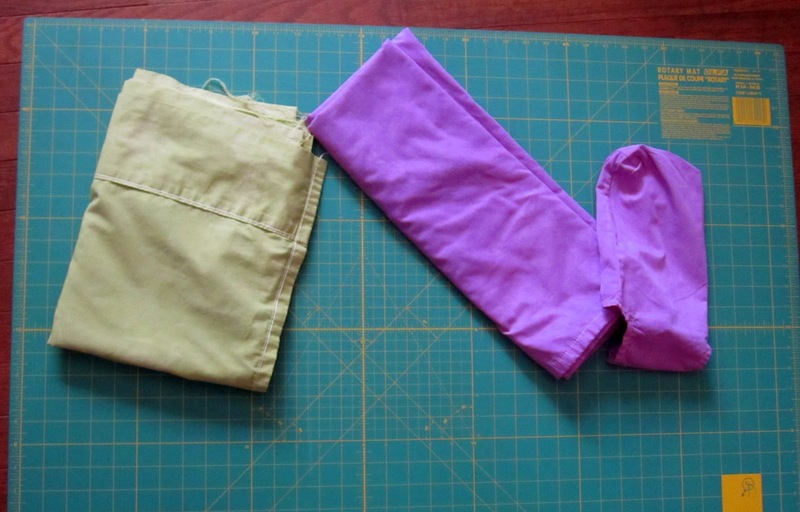 I knew I wanted to dye the fabric and purple and green were the dyes I had on hand. I cut (really I tore) the sheet in half and dyed each piece separately. I dyed the bag too, hehe. I really love the color the purple turned out. The green is a much nicer color than it shows in this picture! It’s lovely too. At the risk of making yet another PURPLE clothing item for Bean, I decided the green would have to wait for another project. I had no idea what I wanted to make with the fabric once it was dyed though. I thought I’d like to smock since I knew I wanted very little embellishment and to leave the base of the outfit simple. That’s what I like about smocking. It is seemingly fancy, yet left on its own it is just a simple twist of fabric that gives some interest. This time around I spaced the grid about 1/2 an inch apart whereas last time it was a little under 3/8 of an inch. I definitely think bigger is better in this case. 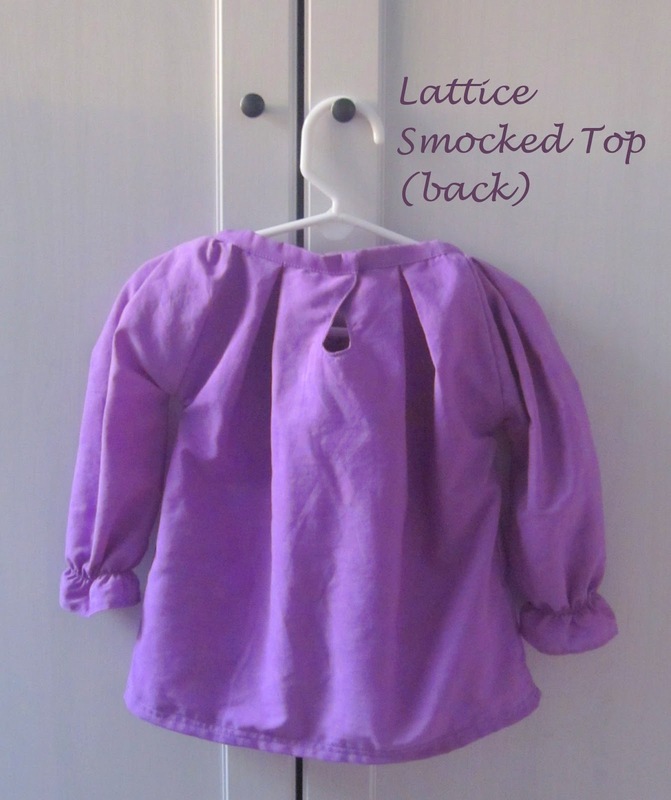 It takes some time to hand smock, but it looks so much nicer than the basic machine smocked stitch. Don’t get me wrong, I’ve used machine smocking before and love it, but there is something satisfying about knowing you’ve hand stitched. A top was in order since I made two dresses last week. I just cut out some rectangles similar to how I made Bean’s bishop dress and sewed them together. Bean is still in need of fall clothing so there was no question I’d make this long sleeved. Short flutter sleeves kept calling out to me, but I settled for an elastic gather at the wrist. I’m so glad I did. The big puffy shoulders slim arm and gathered wrist are so cute on a baby. It gives the top a fairytale feeling. I haven’t done a nice wide boatneck for Bean so I thought this would be the perfect way to showcase the smocking. The back has a keyhole opening with a crossover snap. That way I can adjust the snap (sewn in) as she grows so this top should fit for a while. I also added a pleat on either side of the opening so the stiff sheet fabric would hang nicely as she grows. I purposely made it big all around since the cooler weather is only just starting. 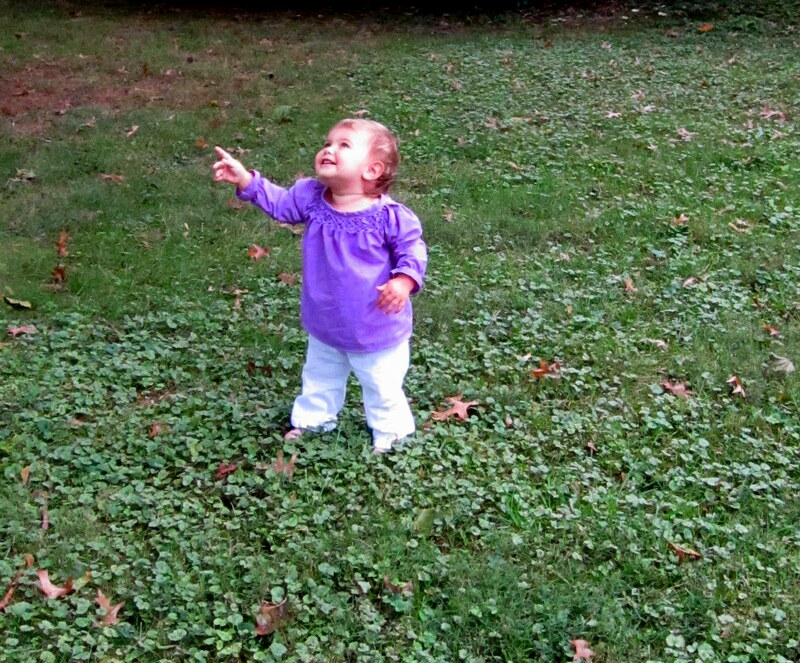 Bean has become very aware of airplanes recently and has to point out every single one. Even when we’re inside. It’s amazing how we learn to tune a lot of that stuff out as we grow older. Most of the time it takes me a minute to realize that’s what she hears, hehe. In case anyone is wondering, the pants she is wearing are the Is It Summer Yet pants that I made back in April. I’m so happy I made them big. They fit perfectly now. I definitely need to whip up a few more pair for fall/winter. I love the detail of that smocking!! Love the smocking. How do you get the lattice effect? The smocking is gorgeous. I like the puff of the sleeve too. Too cute! 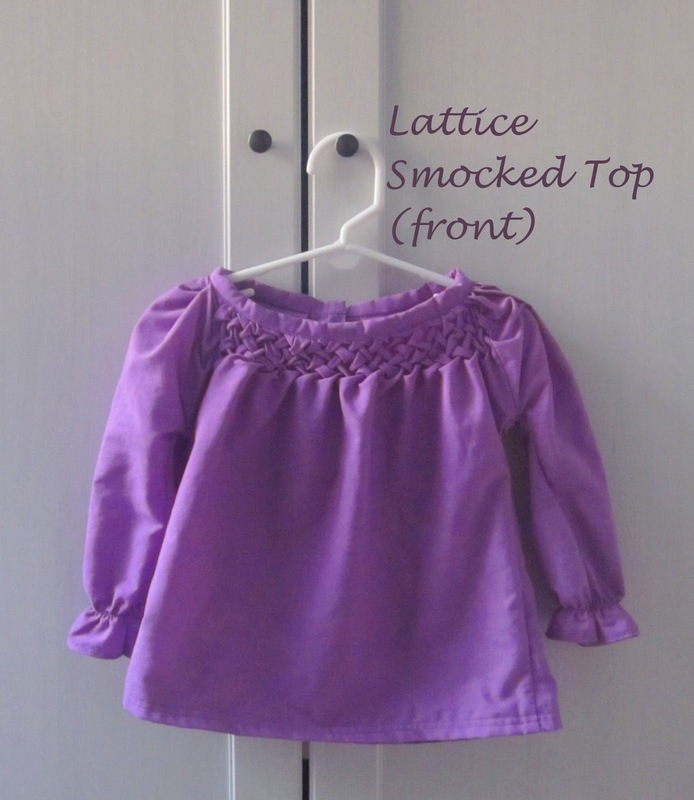 I want a smocking tutorial! Melissa, I finally got the pictures I needed to finish the tute I started months ago haha. 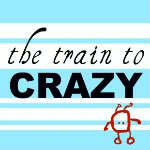 Look out for the tute this week. THANKS! Wow this is so pretty! I love the smocking,you nailed it!